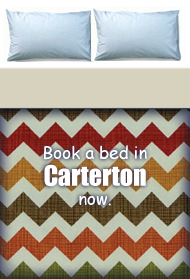 You'll find plenty of things to do in Carterton - a town full of character! Browse vintage stores and artists' studios, go on a garden tour or bush walk, then catch a show at the Events Centre. Every year in January, Lavender Abbey hold popular "Pick Your Own Lavender" days at their property in Carterton, where you can pick your own bunch of gorgeous lavender. The Wairarapa A&P Show is held every Spring at the Clareville Showgrounds just outside of Carterton. Livestock, equestrian, farm machinery and wood choppers all have their day in the sun at this fantastic family event. The Carterton Mountain Biking Track is a great free place to ride a bike in the Wairarapa. Suitable for the whole family and only fifteen minutes from Masterton. Green Jersey Cycle Tours has a fleet of 12 electric assist bikes in the Wairarapa. These Scott e-Sub Comfort bikes are very easy to ride, the assist is a gentle experience that helps take the humps and hollows out of a ride. With an e-bikes it’s easy to explore much more of the Wairarapa or the Rimutaka Cycle Trail. For example you could ride from Martinborough to Cape Palliser! If a group wants to go cycling but some in the group aren't sure they'll keep up, these bikes are the answer! The Mt Holdsworth - Jumbo Circuit is a two to three day tramp to some of the best alpine tops travel in the Tararua Forest Park. The bush tracks are all well marked and signposted and streams are bridged. The Waiohine River has carved out a spectacular gorge, bisecting the landscape and setting an attractive backdrop. The suspension bridge spanning the gorge forms a spectacular gateway to the Tararua Forest Park. Totara Flats Hut is in a beautiful setting at the confluence of the Waiohine River and Totara Creek. At one end of the tramp the track crosses the Waiohine Gorge suspension bridge, the largest of its kind in New Zealand. Mount Holdsworth is the main entrance to the eastern side of the Tararua Forest Park. With some of the highest peaks in the Tararua Range, Holdsworth offers short walks and longer tramps through forest and into the alpine environment. One of the most popular day trips in the park is the climb to Mountain House Shelter along the easy grade of the Gentle Annie Track. Holdsworth is the main entrance to the eastern side of the Tararua Forest Park. Set against the backdrop of some of the highest peaks in the Tararua Range, Holdsworth offers short walks and longer tramps through attractive forest and higher up into the alpine environment. The Tararua Range provides Wellington, Wairarapa, Horowhenua and Manawatu with an outstanding variety of tramping, hunting and walking opportunities in a wild, natural landscape. The best way to get a view of and access the Wairarapa's Tararua and Rimutaka Forest Parks, rivers, gorges, lakes, valleys and remote huts is by air. Just outside of Carterton Fensham reserve is large loop track that takes you through towering native trees and it's one of the best walks in the Wairarapa for families. Follow the boardwalk through a recovering wetland and remnant of flooded forest at Carters Reserve just outside on Carterton. The Carterton Golf Course has 18 holes to par 7. For a change from the norm they also have FootGolf! For millennia people have gazed in awe at Stonehenge and other great stone circles, often totally unaware of how these structures were used. Now a full-scale working adaptation of Stonehenge has been built right here in Aotearoa, allowing all New Zealanders to experience the wonders of stone circles for themselves. Situated in the Wairarapa countryside, a short distance from Wellington, Stonehenge Aotearoa is a window into the past where the visitor can rediscover the knowledge of their ancestors. This self guided tour takes you straight through the Wairarapa on State Highway 2. Stopping at the region's World War I highlights. Wairarapa Heritage Association is a trail of Wairarapa museums running from Featherston to Mount Bruce. Check out some of the fabulous places you can visit! This self-guided tour takes you to many of the Wairarapa’s towns and villages on a scenic tour of the region. The itinerary is best done over a couple of days but you could squeeze it in with a busy day. Heart of Arts, based in Carterton is a unique arts, culture and heritage hub showcasing local artists. The Carterton Events Centre is the most modern and largest non-pillared, flat floor space in the Wairarapa. Full staging and raked seating options, this blank canvas is yours. Catch the steam train, pick daffodils at Middle Run and enjoy the Carterton street market as part of the town's fun-filled daffodil festival. Paua World is a great place to shop in Carterton. Filled with all your kiwi souvenirs, most incorporating the beautiful paua shell, take some time out and delve into this fun and creative gift store. Regent 58 Ale House is one of Carterton's little gems. Down an alleyway just off the main street, it's the perfect place to enjoy a pint of craft beer with friends, and chat to brewers Gary and Brent. Celebrate your wedding day at the Carterton Events Centre. There are a range of venue options to suit you and your guests. The Gladstone Inn, also known as the Gladdy or the Gladstone Pub is just ten minutes from Carterton in the Wairarapa and is a great place to eat! The Gladdy is family friendly and has outdoor dining options. Sitting on the edge of Carterton, The Clareville Bakery, a real European style cafe, produces beautiful pastries, pies, breads and desserts, all made in-house with only natural ingredients.